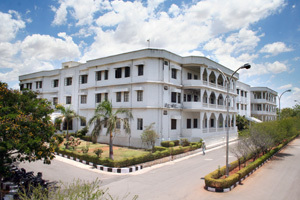 International Institute of Information Technology in Hyderabad is a joint venture of the Government of Andhra Pradesh and few private groups. It is the premier IIIT in India to be established in the year 1998. The institute has been awarded with the status of a deemed university. It is a full time technical school that imparts hands-on training in specializations that cover a wide range of industries. The institute is basically known for offering world class education to those students who want to enter into the evergreen field of engineering. The college not only offers Under Graduate but also Post Graduate and dual degree programs. Under Graduate programs include Bachelor of Technology (B.Tech) with special focus in different fields of Information Technology. It also endows M.Tech, M.Sc and M.Phil. Dual degree programmes award B.Tech/M.Sc. Positions for Ph.D degrees are also available. (1) For tuition fee, admission fee, deposits, and hostel fee etc: Demand Draft in favour of "IIIT, Hyderabad" Payable at Hyderabad. International Institute of Information Technology (IIIT) is located in the capital of Andhra Pradesh i.e. Hyderabad. The most striking feature of the campus is that it is situated close to many software development companies like Microsoft, Oracle Corporation, Infosys and GE capital. It has a Wi-Fi enabled campus and is accorded with modern infrastructure facilities. There are three hostels, out of which one is for girls. The computers lab has high speed internet connection. The class rooms have wireless LCD projectors that are permanently mounted. International Institute of Information Technology Hyderabad has played a crucial role in research and in providing technical manpower and expertise to the country. Over the years, placement record of the Institute has been exemplary, with a record of excellent placements. Are you Interested in International Institute of Information Technology (IIIT) Hyderabad.